She lives in New York City, runs a million-dollar fashion business and has been the subject of several breathless inspirational stories. And it’s not hard to see why; Monica Phromsavanh’s story is like a Hollywood film. From a refugee camp in a rural town in northern Argentina to midtown Manhattan, hers is an irresistible rags-to-riches tale. Born and raised in a camp in a small community of Lao refugees, Phromsavanh knew poverty and struggle from a young age. Her parents had fled Laos during the Revolutionary War, and chose to settle in the town of Misiones, where they were farmers. After her parents divorced, she dropped out of school at 14, worked in a factory and eventually made her way to the US. There, she began working in fashion retail, steadily making her way through the industry until, in her late 20s, she became an entrepreneur, starting her own online style service. Her company, Modabox, delivers fully coordinated outfits curated by stylists to customers who have provided their fashion preferences via the company’s own algorithm. Today, it’s a business worth millions, with a retail space in fashionable Chelsea. Phromsavanh is adamant that her mission is not yet accomplished, that she will never take her success for granted. She also knows that she got to where she is mainly through the grit and determinations she developed growing up a refugee in Argentina. But there was a time when Phromsavanh felt ashamed of where she had come from, and confused about her own identity. She is dining with friends at a trendy speakeasy in Gramercy Park, New York City, when she steps out to take my call. It’s around 10pm, and as she stands on the pavement, the night crowds swirling audibly around her, she’s about as far away as possible from her childhood. But she has no trouble remembering her confusion when she was growing up, not quite Lao, not quite Latina. “In my early days, when I was teenager, I had an identity crisis and I was embarrassed,” she says. She remembers one of her first big media interviews with NBC news, when she brought up her childhood for the first time. “I didn’t know how far that story would come,” she says. She says it wasn’t until three years ago, already in her 30s, that she finally visited Laos for the first time, tracking down her father’s remaining family in Vientiane. Seeing where her family came from was, she says, a revelation. “The dirt, the air, the motorbikes, the mango plants, the papaya plants – I just had this flashback where I was in Argentina and the town where I was actually born,” she says. She also had the chance to meet one of her cousins, the daughter of her father’s sister who died not long after the end of the war. The children were adopted out, and this cousin had ended up working in domestic service. For the first time, Phromsavanh says, she realised that while she had always thought her life had been hard growing up, it hadn’t been as difficult as many others who had stayed in the country after the war. “She had a very different destiny, and I connected with her,” she says. Phromsavanh grew up speaking Spanish at school and Lao at home, in a small community of around 100 families, and didn’t learn English until she moved to America. But after that, through luck and hard work, opportunities opened up to her, in a way they wouldn’t have if she had stayed in Laos. “In Laos, if you don’t have the last name or don’t belong to certain societies, it’s quite difficult, so I think that’s what my cousin’s going through because my family happened to be farmers,” she says. 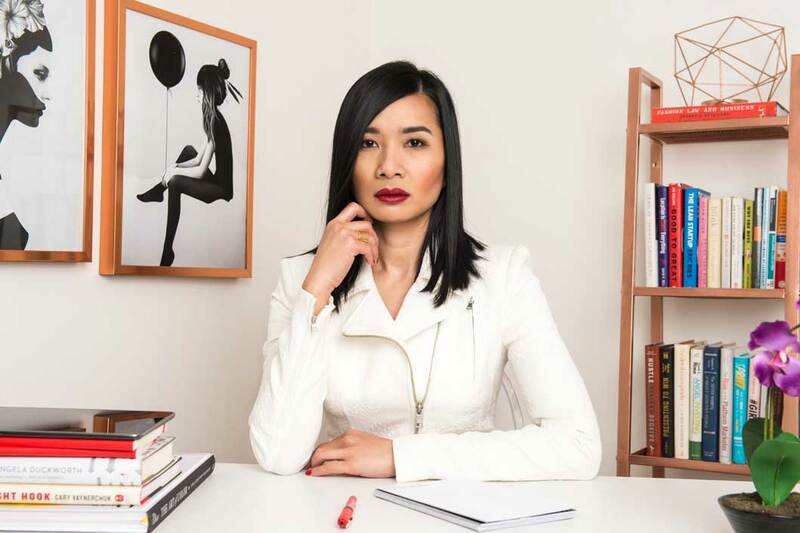 Today, Phromsavanh is focused on her high-octane, high-powered New York life, where the work never stops and the possibilities are endless. Although it is hard sometimes to forge an identity in the fashion world – is she Asian? Is she Latin-American? – she now focuses more on the business and technology side of her work. “I’ve been doing this for long enough that I don’t mind anymore. Fashion is glamorous and all that, but I don’t look at fashion the way, I just look at it from the business perspective,” she says. “I do try to sometimes recognise all the work I have done so far, but at the same time I always say this is just a scratch on the surface,” she says. This evening, as she stands on the pavement in Gramercy Park, her life probably does resemble a movie. But she’s adamant that not all nights are like this. “I work harder than I play, and I’m grateful for having the life that I have now, but that didn’t come from overnight success and that didn’t come for free,” she says.